Dwight Byers enjoyed a more unusual childhood than most - acting as a guinea pig to the formidable Eunice Ingham. In Upper New York State during the 1930’s, Miss Ingham developed a method of reflexology which is practised worldwide today. Dwight, now 72, literally followed in her footsteps and now tours the globe to teach and perfect the therapy using his aunt’s technique. At Soroptimist House, Nether Edge, Sheffield, he was found doing hands-on demonstrations to advanced students and practitioners. What was it like having an aunt famed for manipulating people’s feet? "I was my aunt’s guinea pig at the age of four or five before she wrote her first book. I thought it was strange but you didn’t know any different as a child," he says. "To have your feet done to your average person in those days was absurd and for a woman to do what she did in those days was unheard of." Eunice had taken up the challenge to explore a technique emerging with a couple of doctors then referred to as ‘zone therapy’. They had found working on certain points of a patient’s hands had led to improvements in health. Modern reflexology - applying pressure to points on the feet to improve health - is gaining wider acceptance in the UK but sceptics often dismiss it as merely foot massage. Dwight points out - and illustrates - in his books a wall painting dating from around 2,330 BC in the tomb of Ankhmahor (the highest official after the king) at Saqqara that shows the ancient Egyptians practising reflexology on hands and feet. Reflexology works on the principal that the reflexes in the foot are linked to the organs of the body and divides the foot into zones accordingly. If the practitioner feels a grittiness under the skin in a particular area - like "grains of salt" - it suggests the channels in the zone may be blocked. Reflexology aims to clear those blockages and eliminate toxins. Eunice Ingham called it a science and Dwight uses it purely in a medical context. "Some people use it as a spiritual thing. I don’t go for that at all. I’m thinking more in the medical realm. We’re not doctors but we are a complement to doctors. Doctors in the US and Britain are beginning to recommend reflexology to patients. We’re a supplement to the health field," he says. "We’re not a substitute. We can help people get over their problem faster. Surgery is sometimes inevitable but we can help the body heal faster from it." Another reason Americans are turning to reflexology, he says, is the price of drugs. "Drug companies own the medical profession. The price of drugs in America is the highest of any country and this is driving people faster to try integrated medicine." The term ‘integrated’ itself suggests reflexology’s acceptance. Although Eunice had been practising and lecturing all over the states, it was only when she worked in a hospital in the 1950’s, using reflexology to diagnose problems and recording her findings on a clipboard, that doctors sat up. "People began to realise we weren’t a bunch of quacks. Eunice was a very strong and gifted woman, way ahead of her time. She was no wimp. She was so convincing and to top it off she got results. She backed up her mouth with results." Dwight says that in modern times reflexology has had a bad press through its association with massage. "People give a foot massage and it doesn’t work and it gives reflexology a bad name." 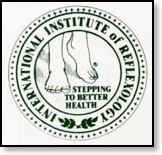 The International Institute of Reflexology, of which Dwight is president, trains reflexologists for a year and expects them to update their training on a regular basis. Reflexology, IIR, AOR, FFR Cert, International Institute of Reflexology, Association of Reflexologists, VRT, Vertical Reflexology in Chesterfield, Finger Free Reflexology, holistic therapies, stress reduction, relaxation, peace, calm, wellness, complementary therapies, alternative health, relaxation, wellbeing, health, peace, calm, wellness, stress reduction, spiritual development, personal development, in Sheffield, Bradway, Dore, Totley, Nether Edge, Ecclesall, Norton, Meersbrook, Crookes, Walkley, South Yorkshire, Dronfield, Holmesfield, Coal Aston, Eckington, Derbyshire, Chesterfield, Brimington, Hasland, Newbold, East Midlands, Peak District, Hope Valley, Hathersage.